Debate and Negotiate Performance Goals with Full Knowledge of what is Possible. Here is an excellent example of a common business conflict of desires. Management wants both to grow the company by achieving high Net Present Value from its investments and simultaneously show high Return on Capital Employed (ROCE) in the year 2006. Growing a company with high NPV projects in capital intensive industries usually requires investing money in plant, equipment and facilities prior to generating positive earnings. High NPV (High Growth) portfolios may then require higher Assets and lower earnings in the initial years than low NPV portfolios. 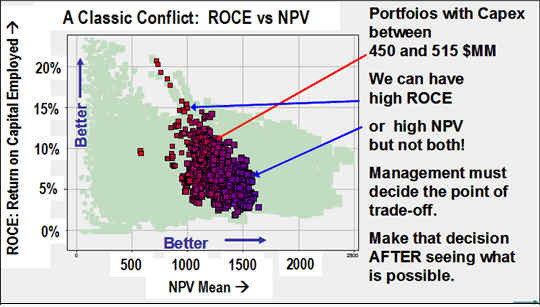 The Spotfire ROCE vs NPV chart above clearly shows an unavoidable trade-off between the goals of High ROCE and High NPV. Each dot is a candidate portfolio of investment decisions.The red-blue squares are portfolios that spend between 450 and 515 million in capex. The pale green dots are other portfolios outside that capex range. We found portfolios that deliver 20% ROCE, but can only deliver 700 MM in NPV. There are other portfolios that generate 1600 MM in NPV, but deliver less than 5% ROCE in 2006 while staying within the 515 MM Capex budget. Management may want a 12% ROCE and an NPV at least $1500 MM, but we can see from the plot there are no portfolios that satisfy those desires AND stays within 515 MM Capex. Something has to give. More Capex to reach both NPV and ROCE targets? Find a compromise between ROCE and NPV while keeping Capex at 515? 14% ROCE and 1200 NPV are possible. So is 14% ROCE and 1400 MM NPV. It makes little sense to go beyond 9% ROCE and 1600 NPV. There is no right answer! This is a decision -- ideally a negotiation --, about values and goals that must be made by management. With Blitzport, we now have the ability to show live in the conference room the possible trade-offs between goals, or resource limits, and our opportunities.